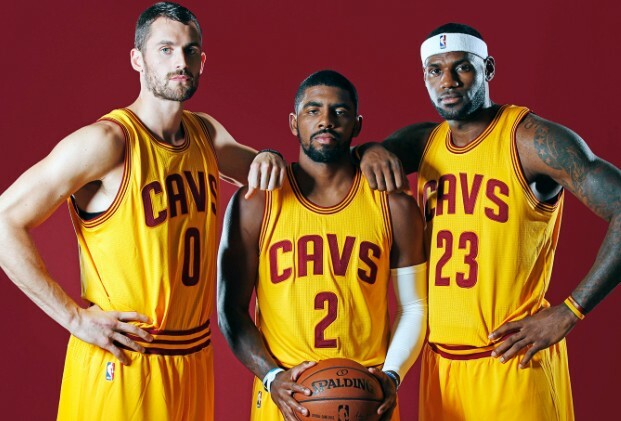 Kevin Love, Kyrie Irving and Lebron James, the new Big 3 in the NBA. We’re just two nights away from arguably the biggest night in the history of Cleveland sports. The Cavs season opener vs. the New York Knicks and the official return of Lebron James as a member of the Cleveland Cavaliers. It’s going to be an emotional night for Cavaliers fans as Lebron dons the Wine and Gold for the first time since May of 2010. His decision to return capped the greatest offseason in franchise history, a new coach and a completely revamped roster including the addition of an All Star power forward helped transform the Cavaliers from a lottery team into a championship. The offseason started off with the shocker of the Cavaliers winning the draft lottery for a second year in a row and third time in four years with a 1.9% chance of winning. The pressure was then on new Cavaliers general manager David Griffin to get the pick right as at the time, the Cavaliers were a struggling franchise winning only 97 of the 312 games since the 2010 season. After debating between Duke forward Jabari Parker, Kansas center Joel Embiid and Kansas guard Andrew Wiggins, the Cavaliers selected Wiggins with the number one pick on June 26 and made their intentions known that they would keep Wiggins instead of trading him. The Cavaliers were also in the search of a new head coach after firing Mike Brown after only one season. The search took longer than fans and the media expected. They interviewed a lot of candidates, even offering Kentucky head coach John Calipari both the head coach and president of basketball operations in a ten year deal worth 80 million dollars but Calipari chose to stay in Kentucky. On June 20, the Cavaliers hired Maccabi Tel Aviv head coach David Blatt to the same position. Blatt brings his offensive prowess that helped win him six Israeli Cup and five Israeli League championships to the NBA but it’s a far different style of play between the NBA and Euroleague. He’s not known for being a defensive coach so that could be a problem while making the transition to the NBA. The Cavaliers also brought in Tyronn Lue as the associate head coach, he was brought over from the Los Angeles Clippers after being an assistant under Clippers head coach Doc Rivers. Lue was also a finalist for the Cavaliers head coaching job before losing out to Blatt. I think Lue will help ease Blatt’s transition into the NBA. On July 1, free agency opened up and also opened the window for NBA teams to sign players from the 2011 draft class to extensions. The Cavaliers wasted no time in signing point guard Kyrie Irving to a five year, 90 million dollar extension. Many were surprised at the time that Irving committed to the Cavaliers after rumors circulated that he was frustrated with the direction of the team and there was a possible rift between him and shooting guard Dion Waiters. Him signing that extension showed to me that he was committed and that he wanted to step up and be the team leader many of Cavaliers fans expected him to be, or that the Cavaliers had a few tricks up their sleeve. The rumors started swirling about Lebron James’ return to Cleveland after the Miami Heat’s loss to the San Antonio Spurs in the NBA Finals. Lebron disputed those rumors, saying he wanted to go on vacation before making any decision. While on his family vacation, his agent Rich Paul invited the Cavaliers, the Phoenix Suns, the Houston Rockets and the Dallas Mavericks to his office in Cleveland once free agency opened to make a pitch about why Lebron should join their team. Once Lebron returned from vacation, he looked at what all the teams had to offer and narrowed it down to the Cavaliers and his current team at the time, the Miami Heat. On July 6, Cavaliers owner Dan Gilbert flew down to Miami on what was supposed to be a secret meeting between him and Lebron James, but when 92.3 The Fan in Cleveland’s Joe Lull got tipped that Gilbert’s plane was flying to Miami, he sent out a tweet that started a social media frenzy. Gilbert denied that he was heading down to Miami but everyone seemed to put two and two together. The week of July 6th seemed to feel like an eternity with so many internet rumors about whether or not Lebron was going to stay in Miami or return to Cleveland. On July 11, he announced his return to Cleveland. This time he didn’t need a television special to announce it, he wrote a letter with the assistance of Sports Illustrated writer Lee Jenkins. In the letter, he talked about how the Decision special was a mistake and that he still would’ve left just not under that circumstance. He also talked about how leaving Cleveland for Miami was like going to college and that it helped him become a better basketball player because he learned how it is to become a champion and it also showed him how much Northeast Ohio meant to him and he hadn’t realized it until he left. With Lebron back in Cleveland, many made Cleveland the odds on favorite to win the NBA championship. The roster didn’t really show it though, they were still a very young team with guards Kyrie Irving, Andrew Wiggins, Matthew Dellavedova and Dion Waiters and forwards Anthony Bennett and Tristan Thompson. Those six players had a combined zero playoff appearances. Lebron wrote in his letter that he knew instant success wouldn’t come right away because of the youth on the team. Lebron only signed a two year deal, he did it because of the looming television deal which would rise the salary cap which would increase the maximum contract salary, but some in the media think Lebron also did it to put pressure on David Griffin and Dan Gilbert to keep making the roster better to make them championship contenders. Griffin went right to work with the help of Lebron’s recruiting to bring some veteran experience to the Cavaliers. The Cavaliers added Shawn Marion, Mike Miller, James Jones, and Brendan Haywood who will help bring playoff and more importantly championship experience. The Cavaliers are still waiting on the decision of guard Ray Allen, the Cavaliers have been recruiting him all offseason but Allen is still deciding whether to return for a 19th NBA season or to retire. On August 23, after almost two months of speculation, the Cavaliers sent Andrew Wiggins and Anthony Bennett and a future first round pick to the Minnesota Timberwolves for All Star power forward Kevin Love. Love is one of, if not the best power forward in the NBA. He will join Lebron James and Kyrie Irving and form their version of the Big 3. Love’s great rebounding, outlet passing and shooting will be a great addition to the Cavaliers. Love and Irving will have a tough transition period, they’re used to being the top option, now they’re the respective second and third option on the Cavaliers. I fully expect this Cavaliers team to be a championship contender in the 2014-2015 NBA season barring two factors: injuries and defense. Love and Irving have an injury history so it should cause some concern for Cavaliers fans, but the Cavaliers have some depth and should look to rest Love, James and Irving some nights to keep them healthy for the playoff run. Defense should be a huge concern as David Blatt isn’t known for his defensive coaching. Having guys like Lebron James, Anderson Varejao and Shawn Marion who are great defensive players will help but there’s questions marks with players like Irving and Waiters. In the end, I expect the Cavaliers to win at least 55 games and representing the Eastern Conference in the NBA Finals, I don’t however expect them to win it all this season due to lack of playoff experience by some players on the roster compared to other teams in the NBA like the Spurs, Thunder, Clippers and Bulls. I expect the Cavaliers to give those teams a fight but in a seven game series, i’d expect them to falter due to the experience, but don’t worry Cavalier fans and Cleveland sports fans, the championship drought is going to end soon and it’ll because of the Wine and Gold. QB change on the horizon for the Browns?